Sport Relief is back with a series of epic challenges building up to the whole nation getting moving and beating a billion steps a day, every day, from 17th-23rd March. In Wales, rugby hero Gareth ‘Alfie’ Thomas is leading the charge by facing up to his biggest fear. He may be brave in every field of life – including the rugby one – but there is one thing that really terrifies the big man – heights. So, to raise money for Sport Relief he is going to skydive from 12,000 feet and he won’t be doing it alone. Gareth will be joined by a team of people who have never parachuted before but who all have one thing in common, they are all over 60. One member of his team is Spencer Bartlett from Cardiff. Spencer is 65 years old and is married with four children. He retrained nine years ago as a Teaching Assistant and now works at Ysgol Ton-yr-Ywen in Cardiff. Before re-training, he worked for a South Wales brewery company as a stock-taker, before becoming a regional manager for a national auditing company. For 16 years he travelled around pubs, clubs and hotels covering mid and South Wales, and the M4 corridor. He’s always dreamed of doing a skydive and wants to inspire the 500 children at his school and show them that age is no barrier to achieving their dreams. He’s also hoping that they’ll take his challenge on board and help with the fundraising. Also joining Gareth on his mission is Dilys Price. 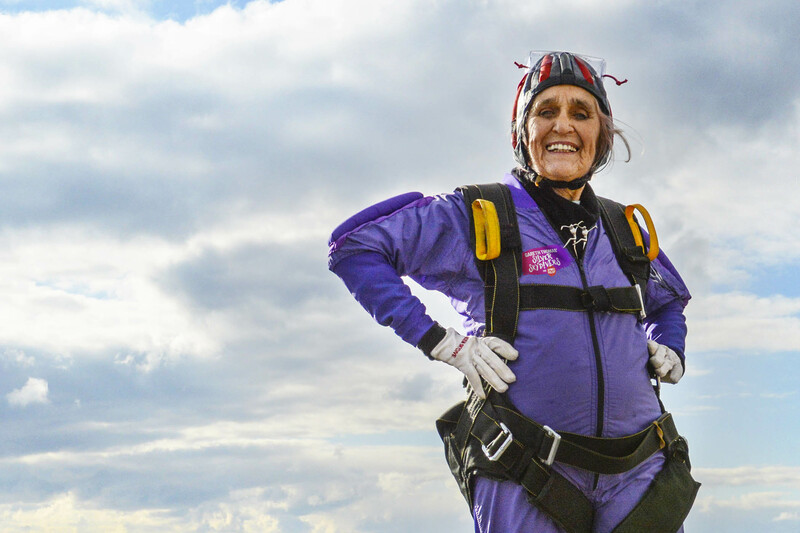 At 85 years old, Dilys holds the Guinness World Record for the Oldest Female Skydiver. Dilys will be sharing the tricks of the parachuting trade with Gareth ahead of the challenge. Recruited from the four corners of Wales, Gareth’s silver skydivers will be his support system to conquer his fear as they all take to the air. To calm his nerves ahead of the jump, Gareth will try his hand at a range of high-altitude challenges, including mountain climbing in Snowdonia. He will also meet his new team mates and also get a first-hand insight into what it’s like to grow older in modern Britain. The team’s adventures will be filmed for an extra-special BBC Wales documentary, Gareth Thomas’ Silver Skydivers for Sport Relief. BBC viewers will be able to see all the action unfold and find out if Gareth can face his demons in the one-off documentary that will air in March. Gareth’s feat is just one in a long list of challenges on the cards for this year’s Sport Relief. For the first time ever, the entire nation has been given a collective mission to beat a billion steps a day, every day from 17th-23rd March, tracking their progress through the brand-new Sport Relief app. Running, dancing, dog walking or Zumba-ing all count towards the step total as the nation comes together to raise money and help vulnerable people, across the UK and the world, to live happier, healthier and safer lives. For more information on how to get involved with this year’s Sport Relief campaign, download the Sport Relief App for free or go to sportrelief.com.